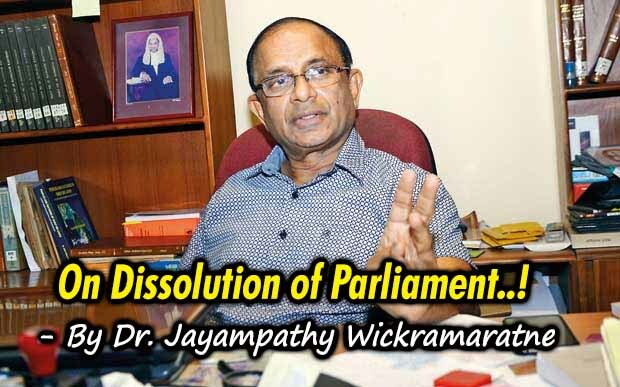 (Lanka e News - 09.Nov.2018, 4.20PM) There is speculation that Parliament will be dissolved. Arguments have been made for and against the right of the President to dissolve Parliament at will, at any time. It is a golden rule that in interpreting a Constitution, the Constitution as a whole must be looked at, not at just one provision in isolation. If the issue is related to an amendment made to the Constitution, we need to look at the corresponding provisions before such amendment. The intention of the legislature in amending the Constitution must be considered. If the amendment was consequent to a pledge made at an election, then the circumstances of that election must also be considered. Constitutional provisions cannot be read in isolation, in a vacuum. Before the Nineteenth Amendment that came into force on 15 May 2015, the Constitution gave the President a near-unbridled power to dissolve Parliament at will. Article 70 gave him the power to so do, subject to just one limitation. If the previous Parliament had been dissolved prior to it completing its six year term, then the President could dissolve Parliament only after one year. At the Presidential Election of January 2015, one of the main issues raised was the executive presidency. The forces that supported the common candidate were clearly for limiting Presidential powers and strengthening Parliament. One does not have to labour the point. The Nineteenth Amendment, which was passed with just one Member of Parliament opposing it, reduced the term of Parliament to five years. Provisions that Supreme Court held required a Referendum were amended or dropped. Article 70 of the amended Constitution restricted the power of the President to dissolve Parliament. It now provides that “the President shall not dissolve Parliament until the expiration of a period of not less than four years and six months from the date appointed for its first meeting, unless Parliament requests the President to do so by a resolution passed by not less than two-thirds of the whole number of Members (including those not present), voting in its favour.” Thus, Parliament can now be dissolved by the President in the first four and a half of years of its term only if 150 Members of Parliament so request by a resolution passed in Parliament. The wording is clear and unambiguous. (c) to summon, prorogue and dissolve Parliament…”. It is argued that Article 33 (2) (a) overrides Article 70. Article 33 only declares some of the general powers of the President. The manner in which and the conditions under which that power of dissolution can be used are given in Article 70. That Article states that dissolution shall be by Proclamation. Then it goes on set down the clear limitation that the President cannot dissolve for four and a half of years unless Parliament so requests by a two-thirds majority. Any power that the President claims under Article 33 (2) must not be in violation of express provisions of the Constitution. The words “In addition to the powers, duties and functions expressly conferred or imposed on, or assigned to the President by the Constitution or other written law…” cannot be used to override expressly laid down constitutional limitations on the powers of the President. Can the President take cover under this provision and appoint the Chief Justice and other judges of the Supreme Court on his own? Clearly not, because Article 41C requires the approval of the Constitutional Council for such appointments. Article 4 says that the President has executive power. Can the President make appointments to posts in the public service citing Article 4 in isolation, disregarding express constitutional provisions relating to the Public Service Commission? If the argument that the President can dissolve Parliament at any time at will is correct, then Parliament can be dissolved by the President just one day after the new Parliament meets, even if he had dissolved the previous Parliament before it completed its full term. This was something that the President could not have done even before the Nineteenth Amendment. This shows the absurdity of the argument.